A Boom In Oil Is A Boon For U.S. Shipbuilding Industry Ten supertankers are under construction and there are orders for another 15, but just three years ago the tanker market was barely moving. Cranes moving heavy steel pieces that will form part of an oil tanker at the Aker Philadelphia Shipyard. Scott Clapham peers down into a cavernous dry dock at the Aker Philadelphia Shipyard. He points to massive pieces of steel, some covered with a light dusting of snow. When assembled, they will form a 115,000-ton oil tanker. It's one of two oil tankers being constructed for SeaRiver Maritime, a subsidiary of Exxon Mobil, costing $200 million apiece. It takes roughly 1,000 workers more than a year to build, and the shipyard already has orders for four more tankers and two container ships, says Clapham, the senior vice president of Aker Philadelphia. He says orders for large vessels have shot up in the past year. "We've seen, since 2013, just a steady increase in demand for the ships, both here in Philadelphia and other shipyards across the country," Clapham says. A welder at Aker Philadelphia Shipyard. 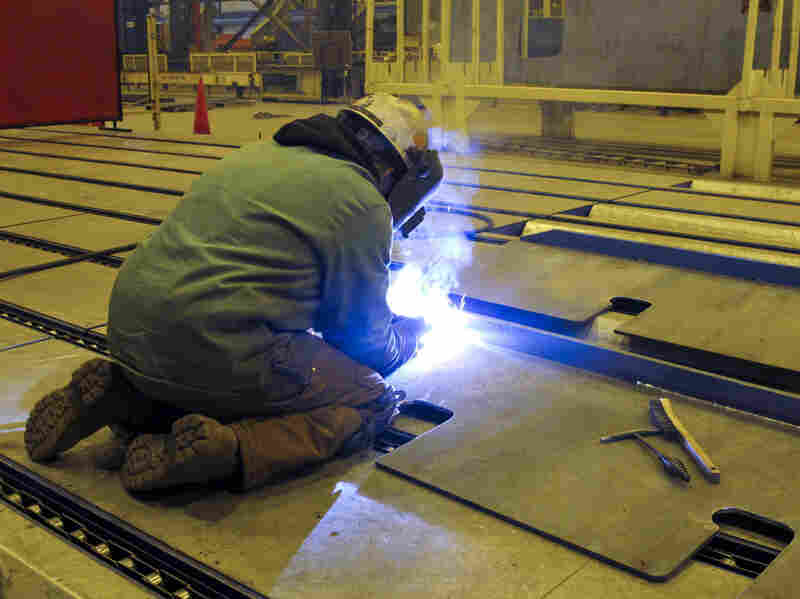 The energy boom in the U.S. is having a knock-on effect on the country's shipbuilding industry. Matthew Paxton, president of the Shipbuilders Council of America, says there is a relative boom in the construction of larger vessels at major shipyards across the country, especially oil tankers. He says three years ago, the tanker market wasn't even on the screen, but shale formations in North Dakota and Texas have changed that. "All this oil is coming down to the Gulf Coast, and we're going to need to move that oil around the United States to refiners," he says. There are more than 15 oil tankers, along with hundreds of smaller tugs and barges, on order at U.S. shipyards across the country, according to the American Maritime Partnership. But it will take months, if not years, to build them. In the meantime, the domestic energy supply is booming, yet oil companies cannot bring in foreign ships to help move the oil and gas around the country thanks to a 1920s federal law called the Jones Act. Tom Allegretti, the chairman of the American Maritime Partnership, says under the Jones Act, you can only move cargo between two ports in the U.S. under certain conditions. "You need to do that on a vessel that is flagged under U.S. law, that is crewed by American citizens and that is built in a U.S. shipyard," Allegretti says. He says the Jones Act helps create jobs and keeps U.S. waterways in the hands of Americans. But others say the Jones Act is pure protectionism for shipbuilders and unions. 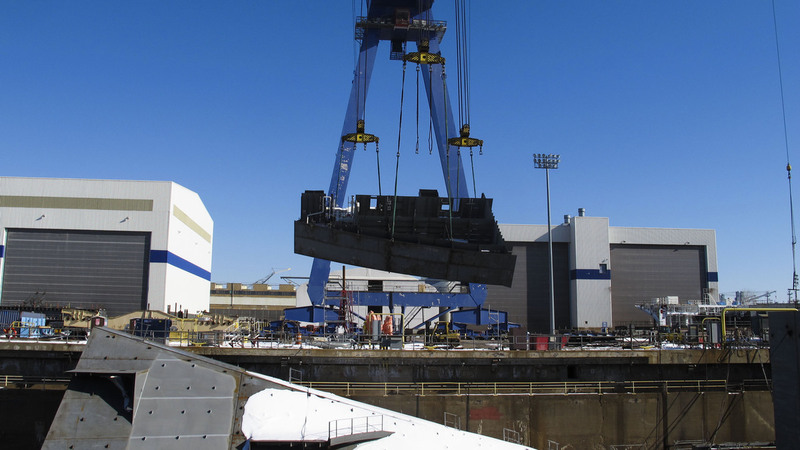 William Gray, an expert and consultant in shipbuilding, operations and regulations, says a lack of competition means the U.S. shipbuilders became less efficient and not as technologically advanced as builders in other parts of the world. "The designing of ships and the engines for ships and the equipment for ships; the United States was not very good at figuring out how to do that," Gray says. Gray says shipbuilding in the U.S. has declined dramatically since World War II, and that there are only a handful of major shipyards now. A good percentage of those vessels being built are ordered by the Navy. Gray says the industry cannot keep up with the demand for merchant ships at an affordable price. "We have very few of these shipyards that we used to have that made the larger ships: tankers, bulk carriers and container ships," he says. He says the cost is about three times as much as you find in shipyards in China, Japan and South Korea. Aker Philadelphia Shipyard's Clapham agrees the Jones Act allows U.S. builders to capitalize on the surge in domestic oil and gas. He says without that federal law, ships would more likely be built overseas. "The Jones Act, with its requirement to be built in the U.S., greatly helps support the manufacturing facility that you see here," he says. But until more tankers come on line, energy companies may have to rely more on rail, pipeline and road to transport the glut of domestic oil and gas.